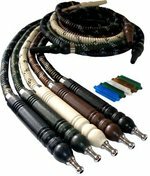 Cloisonnes Hoses are truly remarkable, being made of a durable leather material that will not deteriorate over time. The beautiful handles can be easily unscrewed for cleaning purposes. In addition, the thickness of the hose allows for the smoke to pass through easily and effortlessly, making your hookah smoking experience even more enjoyable. 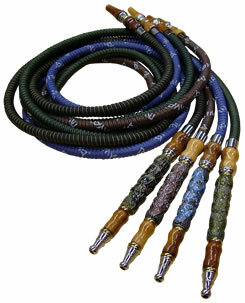 Package Deal: To qualify for the package discount, you must purchase a minimum of three hoses per desired color.